The Child is going on a trip. She will fly on a plane without me; she will hand her passport to a customs officer by herself. She will see Niagara Falls, someplace I have never seen, and ride the Maid of the Mist, something I have never done. I should be happy; I will have some much-needed time to myself. I should be proud; look at my girl, growing up fast! I should be excited; she has the opportunity to see more of the world, something I have always wanted for her. I am sure that I am all of these things, though it doesn’t feel like it when I think about it too much. She and one other girl were invited on the trip by a friend from school, also an only child; she is going to Canada with her family for ten days at the end of the summer. Just before the trip, we have dinner with the family so we could talk about the plans for the trip. The mother of the other invited girl, is also a single mother, is also there. She talks a lot, as she usually does, about nothing in particular: there are no pauses or silent moments around her. The Child and her friends hang out in the hammock while the adults grill and marinate and slice and discuss things like allergies and food preferences and the validity of American health insurance in other countries. I write notes and make a to-do list in a small notebook: The Child will need a suitcase and water shoes. There isn’t much for me to do: the host girl’s father has thought of every possible detail, and paid for everything. I try to think of things I should be asking, but it seems to be under control, and in any case, the constant chatter makes it hard to focus, so I don’t: I relax and watch the three girls, giggling in the hammock. We amble through dinner, sipping lemonade and discussing the latest advances in mosquito-repulsion technology. The chatter starts to wear on me, and I find things to do to be in a different room from it, when I can: I help out in the kitchen, and then focus my attention on the host mother’s cookbook collection. She likes Cook’s Illustrated and Cook’s Country, and I find myself entranced by America’s Best Lost Recipes, a collection of vintage recipes that have been tested in a professional kitchen and tweaked if needed to provide reliable results. I focus on the cookbooks as long as I reasonably can, but then the girls disappear into a playroom, and the four adults are left to discuss the final details. I suddenly realize The Child does not own a suitcase; she is leaving in just a few days and everything has been thought of except the most basic travel necessity. The Departed packed his stuff in her suitcase when he left, and she and I have shared a suitcase ever since, but I am taking advantage of her trip to go away for a few days, too – and I never thought to buy her a new suitcase. I remind myself that, like the babysitting, she is more ready than I realize. She is among friends and clearly well cared for. She will be gone for ten days, and will come home glowing with stories and memories. A day or two before she leaves, I get a copy of America’s Best Lost Recipes from the library, and make her a special breakfast: Waukau, a berry pancake that is partly fried and partly baked, kind of like the pancake version of a frittata. It sounded really good, and not hard. The recipe called for what seemed like a lot of sugar, so I reduced the amount, but the end result was still a bit too sweet for our taste. The pancake itself had a nice crispy bottom, and a crispy-sweet top from the sugar, with the all the berries resulting in a soft middle. The pancake base has very little flavoring and no sugar, so the whole dish is really about the topping. Neither of us really liked it, though we both had ideas about what would make it better: Less sweet and more tart. I thought a strawberry-rhubarb mix with cinnamon sugar would cut the sweetness, or even just something more tart that the blueberries I used. Or maybe just less sugar. My Waukau also did not spread out to fill the pan as the recipe indicated, though it still puffed up nicely. This may have been my fault, since my pan is slightly larger than the 12-inch size called for in the recipe. It wasn’t what we expected, and The Child didn’t eat much of hers. Adjust an oven rack to the lower-middle position and heat the oven to 375 degrees. Whisk the flour and salt in a medium bowl. Whisk the milk, egg, and vanilla in a small bowl. Make a well in the center of the flour mixture and pour the milk mixture in. Whisk until combined; a few small lumps may remain. Melt the butter in a 12-inch ovenproof skillet over medium heat. Pour the batter into the center of the skillet and let it level itself. 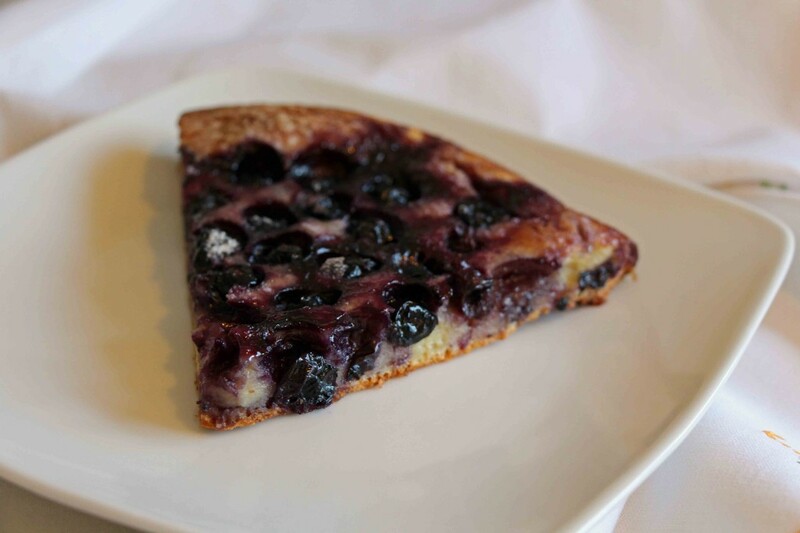 Scatter berries over the batter, leaving a 1-inch border around the edges. Sprinkle the sugar over the berries, again avoiding the 1-inch border. Bake until the edges are puffed and deep golden brown, 50-60 minutes. Transfer to a serving plate and serve immediately. 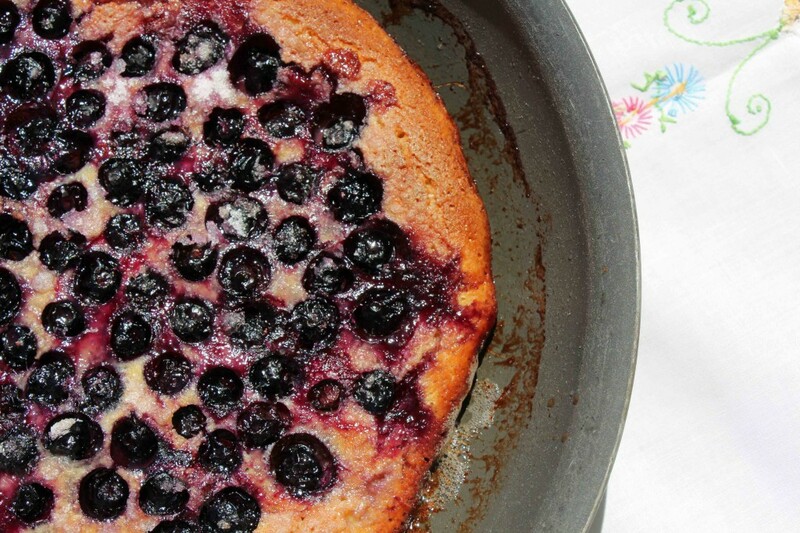 Use any combination of berries that appeals to you for this recipe. I used blueberries. The original recipe calls for ¾ cup sugar; I reduced this amount to ½ cup and still found it to be a bit on the sweet side. Well, it certainly looks delightful. And I love the idea. Maybe apricots when they’re in season next year — not so sweet but juicy! Oh wow. That berry pancake looks so good, I might just forget about my diet. You know me, I’m all about fitness. But what the heck, it looks a healthy snack to me.